Hannah is 10 years old and was diagnosed with celiac disease just shy of her 5th birthday. Tummy pain, leaking urine and severe constipation. Bladder/bowel issues got better but have remained a huge challenge. It's pretty easy to eat gluten-free these days from great restaurant options to lots of products but not to underestimate the emotional toll it can take on our children and to always remember how brave they are. 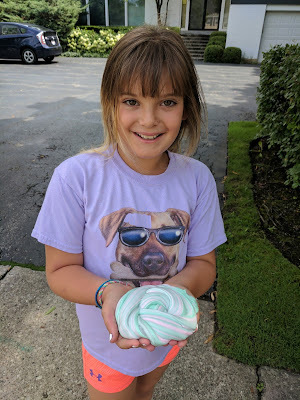 Hannah, you look happy and healthy, especially with that FUN SLIME in your hands!! You and my daughter would get along fabulously!! She loves your shirt too. I'm happy to hear you are doing well and I hope you have a great school year. I love that Mom - "always remember how brave they are." So true. They are the ones walking through life living with celiac disease. They ARE brave and strong...and we need to make sure they know that. The courage of these children is astounding to say the least! I hope they live long healthy happy lives! Kudos to them for their unrelenting bravery!